Kara Magari is about to discover a beautiful world full of terrifying things—Ourea. Kara, a college student still reeling from her mother’s recent death, has no idea the hidden world of Ourea even exists until a freak storm traps her in a sunken library. With no way out, she opens an ancient book of magic called the Grimoire and unwittingly becomes its master, which means Kara now wields the cursed book’s untamed power. Discovered by Ourea's royalty, she becomes an unwilling pawn in a generations-old conflict—a war intensified by her arrival. In this world of chilling creatures and betrayal, Kara shouldn’t trust anyone… but she’s being hunted and can’t survive on her own. She drops her guard when Braeden, a native soldier with a dark secret, vows to keep her safe. And though she doesn’t know it, her growing attraction to him may just be her undoing. For twelve years, Braeden Drakonin has lived a lie. 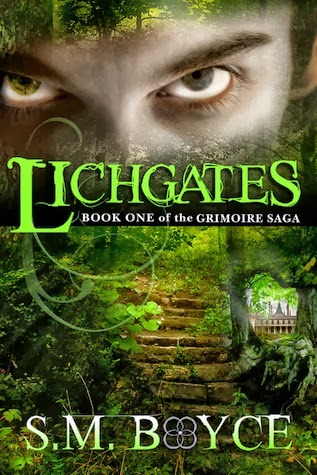 The Grimoire is his one chance at redemption, and it lands in his lap when Kara Magari comes into his life. Though he begins to care for this human girl, there is something he wants more. He wants the Grimoire. Welcome to Ourea, where only the cunning survive. Kara Magari squinted back up the path she’d just climbed. The gazebo’s roof peeked through the trees, evidence of where she’d been only ten minutes before. Not bad. With her finger in the air, she traced the way she’d taken, starting at the lichgate and going down over each step in her head. Her finger hovered and came to a stop, though, when she examined the base of the hill. Built into the rock was a marble door, shrouded with overhanging roots and dangling moss that clung to its frame like bangs. She rubbed her eyes, but the closed entryway was still there when she opened them again. She brushed her hand along the door’s smooth stone. It was simple, with only a round stone knob and a small emblem carved into the rock at eye level. The symbol looked something like a four-leaf clover made out of crescent moons. Kara’s fingers itched on the handle, but she hesitated. The ground trembled with a sudden force that knocked her against the cliff. The breeze stopped, dissolving with a hiss into the hot summer sky. She scanned the valley. Several somethings cracked in the ground under her feet. Thunder rumbled overhead. A dark cloud churned in the sky, and her heart fell into her stomach; there hadn’t even been a single fluffy cloud up there ten minutes ago. A blinding bolt of moss-colored lightning flashed, striking the ground nearby. The hairs on her arms stood on end. Heat coursed through her calves, and she caught her breath. Her ears rang. Wait. Was that lightning green? The cliff trembled as a boom shattered the air. It began to rain. The heavy drops pelted her skin and clung to her hair as another rumble coursed along the far edge of the valley. She needed shelter, and the last place she would go in a lightning storm was up a hill. She turned back and twisted the door’s handle, sighing with relief as it opened—unlocked. Still, as wet as it was outside and as much as she wanted a safe place to wait out the rain, she lingered on the threshold to examine the room. Mud covered everything from the floor to the ceiling. Since there weren’t any supports to hold the roof, she couldn’t figure out how the ten-by-ten dirt shelter hadn’t caved in yet. The air within was heavy, moist with the rot of dead leaves, and her only guiding light streamed in from behind her. Roots dangled from the ceiling like stalactites reaching for the floor. The wind picked up, howling as it pelted rain against her back. Kara tested the ground with her sneaker. The dirt floor supported her weight, so she tip-toed into the room and left the door open. Rain fell in lingering drops on the threshold before it disappeared into the growing pools of mud. She stuck her hands in her pockets and watched the raging storm outside. A flash of dark brown blurred past her. She jumped. A tan flicker snaked along the roof, and clumps of soil fell in sheets. She glared at the ceiling, holding her breath as the settling dust rained onto her shoes. It had almost looked like a root moving, but that—that was crazy.